As you can see, we had a pretty good time and we connected well. 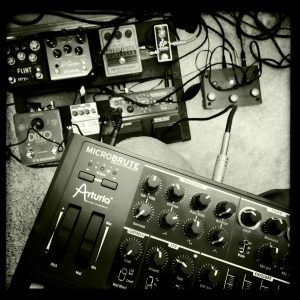 I got to play around with my pedal board, especially the Ditto looper came in really handy, but also harmonizer and ring modulator are in good use. The co-operation is sure to continue, maybe already as soon as mid-October. After finishing a new big band composition this week (ominously titled ‘Spotify my Jazz’) I am now getting ready for next week’s concert of the Contemporary Collective. We’re playing at the legendary Digelius record shop on Helsinki’s Five Corner Square on October 3rd. Come and pop in, it’s free entrance and they always have a bombastic atmosphere there, a comfy sofa and a great host, the owner of the shop: Emu! Last not least, I’d like to mention that UGETSU is gathering some very nice reviews. I might play some of it live in Digelius and of course they’ll have the record there, vinyl and CD. Actually, why not turn this into a little lottery: the first person to come up to me in Digelius saying ‘Hi, I came to listen to your gig because I read your blog’ will get a free copy of UGETSU right there and then. How does that sound?